compressor and fans run for hours but refrigerator won't cool enough. My hotpoint refrigerator Model# CTX18GASWRWH won't cool down. freezer won't freeze! Both compressor and fans continue to run for hours with very little cooling. I unplugged the power for 24 hours then plugged it back in and the freezer cooled down quickley to 20 degrees then gradually went up in temperature to about 45 degrees. I cleaned the condenser coils with no change.I have both the freezer control and fresh food control as high as they will go.The compressor is warm to the touch.The first time I noticed trouble the icecream went soft and there was water overflowing in the tray in the back of the refrigerator.I have no more water problems but milk is going bad quickly! Thanks for any help!Mike. What you describe seems like a refrigeration problem such as a bad compressor, low on refrigerant or a clogged refrigeration line. These types of problems are not do-it-yourself repairs you will have to call a professional. You can confirm that it is a refrigeration problem by removing the cover out the back of the freezer and viewing the freezer coils. 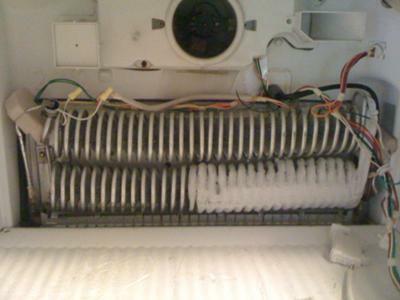 What you will see if there is a refrigeration problem is a partially iced coil such as the one in the picture. If there is a light coat of frost along the entire coils then there isn’t a problem with the refrigeration and if this is the case let me know and we will go from there. Comments for compressor and fans run for hours but refrigerator won't cool enough. Shawn, I just plugged the refrigerator back in after it sat off for 12 hours. I removed the freezer cover and noticed the freezer coils had a nice coat of frost along the entire coil for about 15 minutes. The temperature in the freezer would go from 60 degrees to 40 degrees in this short time then gradually go back up as the frost disappeared. I've done this three times now with the same results. Leave it sit for 12 hours plug it back in watch it cool down for a short period of time and then warm back up wih both fans and compressor running for hours without the coils frosting back up. Should I replace the relay on the compressor? The defrost thermostat looks ok to me. I'll try anything you suggest. The refrigerator is about 15 years old is it worth paying someone to come in and look at it or should I buy new. I have time to work on it. what should I do next? Its a Hot point Model# ctx18gaswrwh. Thanks for getting back to me so fast! Love the site! Mike. If you know for sure the compressor is steady running when the frost disappears then it is safe to say that the compressor is bad. However if the compressor is turning off (but the fans stay on) then the relay or the overload can be the problem. I fear this is unlikely but worth a shot before you condemn the compressor. Typically when a compressor goes bad it will not refrigerate at all. It either will not start or it will run but not frost the coils. However I have seen what you are describing. Basically when the compressor is running the coils should be frosty and if not it is either out of refrigerant, the refrigeration lines are clogged or the compressor is bad. If the refrigeration lines were clogged or it was low on refrigerant it would never frost the coils at all. What I believe is happing is the compressor is pumping then quits but keeps running. I can’t explain how or why this happens but it does. If the overload were bad the compressor will cut off completely. If the relay were bad it wouldn’t start running at all. I hate to give you the bad news, trust me I would love you tell you a cheap easy repair but I just don’t think that is going to happen. Time for a new refrigerator! Shawn, I think it's time I put this refrigerator to rest! Thanks for all the help you've given me. I really learned alot. I'll make sure I spread the word about this site. Take care, Mike.